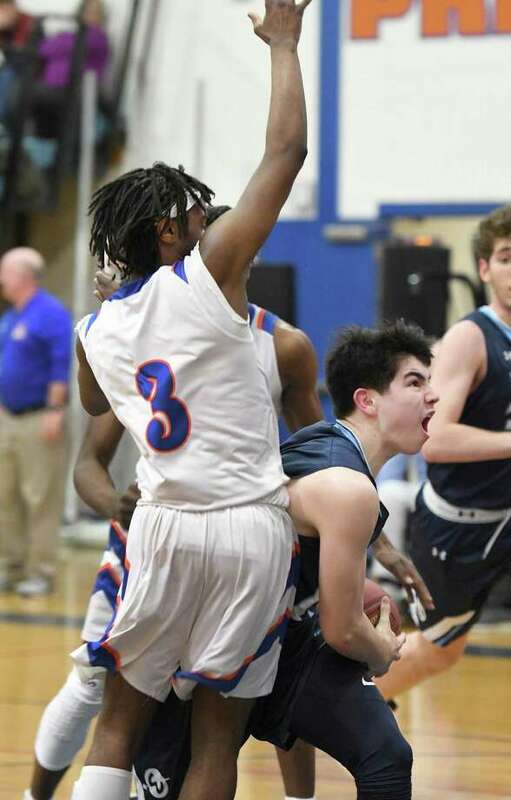 Wilton’s Nicholas Kronenberg, right, tries to get by Danbury’s Keyon Moore (3) and Denali Burton (obstructed) during the Wilton at Danbury boys basketball game, Feb. 11, 2019. DANBURY — A one-possession game in the final 90 seconds is exactly when stars deliver in crunch time. Danbury’s 1-2 punch delivered the knockout blow within 20 seconds to fend off a strong force to stay atop the FCIAC. Denali Burton and Javon Hernandez converted layups down the stretch to help Danbury topple Wilton 61-53 in a matchup between the No. 1 and No. 2 teams in the league. The Hatters led just 53-52 with 1:30 left after a 3-point play from Wilton’s Nick Kronenberg (13 points), but Burton scored from inside and Hernandez added a 3-point play to push the lead back to 58-52 with 42 seconds left. The Warriors couldn’t get a shot to fall in the final stages as Danbury clinched back-to-back wins after a recent loss to Stamford. The game was deadlocked at 45-45 heading into the final quarter and stayed close until the deciding twist. Wilton got 14 points from Ryan Biberon and 12 from Andrew Smith. Wilton (13-4) upended Trumbull 69-60 on Friday to move above the Eagles into second place of the league ahead of Monday’s showdown. Facing the other top squads in the league didn’t add extra motivation, but it showed the Warriors will be as difficult as anyone to knock out of the quickly arriving tournament. Keyon Moore, Danbury: His hot shooting kept the Hatters in the game through three quarters; he sank five triples en route to 17 points to lead all scorers. Tucker Walden 1 1-2 3 Nick Kronenberg 4 4-7 13 Andrew Smith 5 0-0 12 Kyle Hyzy 2 0-0 6 Ryan Biberon 6 2-3 14 Zarion Eysebe 3 0-1 6. Totals: 21 7-13 53. Javon Hernandez 5 4-5 14 Keyon Moore 5 2-2 17 Denali Burton 4 1-4 10 Jah Joyner 2 0-0 4 Taylor Heady 1 0-0 2 Jaden Cook 1 1-2 4 Raimir Rivera 3 0-0 8. Totals: 21 8-13 61. 3-pointers: W—Kronenberg, Smith 2, Hyzy; D—Moore 5, Burton, Cook, Rivera 2.